Finally, Kindle has a pre-order option. Find this option in Step 4 when you publish with KDP. This is now called the Select Your Book Release Option. Select a date. You can schedule your pre-order up to 90 days in advance of the release date. 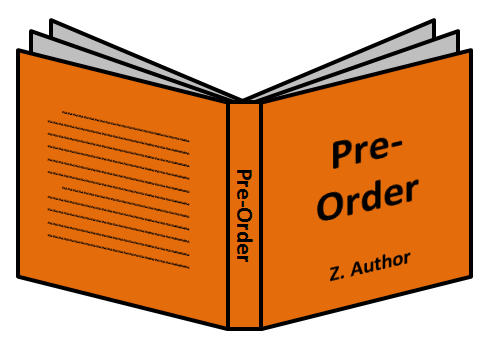 You must upload a draft of your completed book at the time that you schedule your pre-order. In Step 6, declare whether this is your draft or your final version. Enter the description, choose your categories and keywords, upload a cover and the draft of your book, choose a price, and go through all of the usual steps to publish a book with KDP. Click the “Submit for pre-order” button on page 2 of the publishing process. The deadline for uploading and submitting the final version of your book is 10 days before the release date. Upload the final version of your book at least 10 days before the release date. KDP will give you the precise date. Check the option in Step 6 to indicate that this is your final version. Go onto page 2 and press the button to submit your pre-order. Since this is your ‘final’ version, you shouldn’t expect to be able to make any further changes until your book goes live. If you fail to upload your final version by the deadline, (1) your pre-order will be cancelled, (2) Amazon will notify customers that you didn’t publish your book, and (3) you will lose your pre-order privileges for one year. You must be releasing a new book in order to take advantage of the pre-order option. Public domain books aren’t eligible. Scheduling a pre-order gives you a product page with your cover and description (but no Look Inside) for up to 90 days prior to the release date. This gives you something to link to when you proceed to build buzz for your book’s coming release. You can preview how your description looks on the actual product page prior to the book’s release. Visit Author Central to update your description. Your pre-order will show in Amazon search results. This helps customers discover your pre-order, and can help you build search visibility prior to your book’s launch. Your book will show up in the Coming Soon filter (which appears beside the Last 30 Days and Last 90 Days filters). This gives your book a little extra exposure. If you have other books, customers who discover your pre-order may also become interested in those books. If you have an existing fan base, your following may give your book some initial support through pre-order sales. If you succeed in generating many pre-order sales, your book can develop a strong sales rank to help give it some early momentum. Highly successful pre-orders can gain additional exposure as Hot New Releases. More than anything else, a pre-order provides you with a tool that you can use to help create buzz for your upcoming book. But much like sales, it takes effective marketing skills to reap the benefits. Sales rank is a double-edged sword. If you don’t succeed in generating many pre-order sales, a history of slow sales may hurt your book’s visibility. If you upload a draft, what happens if some unexpected event comes up and prevents you from perfecting your book before the deadline (10 days before the release date)? That would be a disaster. Deadlines can be quite stressful. Are you prepared for this? There is a worst-case scenario. You may have read about an author on the KDP community forum whose draft evidently went live instead of the final version of the book. That would be a nightmare. Don’t schedule your pre-order until you already have a ‘final’ version of your book. This removes all the worry from pre-orders. Do you have a large fan base? If so, these fans may help you with pre-order sales. Do you have amazing promotional plans for creating buzz for your book? If so, this may also help with pre-order sales. Is your book already finished? If not, I suggest perfecting your book before you schedule your pre-order. Are you a new author? If you don’t have reason to expect pre-order support, it may be best not to do this. A history of slow or no sales can hurt sales rank. Are you mostly relying on Amazon to sell the pre-order for you? If that doesn’t happen (there is much competition, and pre-orders don’t have a Look Inside), sales rank may count against you. HOW LONG SHOULD YOUR PRE-ORDER BE? You can schedule your pre-order up to 90 days in advance of the release date. The longer the pre-order duration, the more pre-order sales you must drive to build and maintain a strong sales rank. You need a really large fan base or very powerful promotion in order to really benefit from a long pre-order duration. If you schedule a pre-order for one month and just have a few sales, it won’t give you a very good sales rank. If you schedule a pre-order for 10 days and generate many sales during this period, it will give you a healthy sales rank starting out. I see some authors making the pre-order duration 30 to 90 days for the wrong reason: to give themselves more time to perfect their books. Yes, they should take all the time they need to perfect their books. But they should do this before scheduling the pre-order. More sales in less time gives you a better sales rank. Now if you can really drive strong pre-order sales (large fan base or killer promotion), a high frequency of early pre-orders may help you drive more pre-orders and maintain this for a longer duration. Gee, you could come up with a temporary, introductory low price and advertise the daylights out of this. If you have effective marketing skills, you can run a successful pre-order promotion. If you publish a print-on-demand paperback with CreateSpace, for example, you can schedule pre-orders through Amazon Advantage. Visit the CreateSpace community forum. There is a very helpful, detailed post on how to do this by forum member Desire Success. Pre-orders laid out in detail – another one of Chris’ beautifully analytical comprehensive posts. Thanks for the continuing stream of useful usable information. I read Derek Muphy’s post on pre-orders – he missed the deadline in an odd way (Google his blog), and found out that there is no appeal: if you do things wrong, you get the ‘no preorders for a year’ penalty. So I would add that, if you’re going to use the preorder option, you should check the webs for things to watch out for, and at least make sure you don’t get caught by some misunderstanding that is already out there, marked, and blogged about. Just as being firm with limits with your children means you don’t have to suffer an endless stream of whining, because they know you mean what you say, I’m sure Amazon has decided that it isn’t going to give anyone a pass – partly to stem a tsunami of people asking for exceptions. Or I may be wrong – but why take the risk? I think that’s exactly how Amazon feels. Top indie authors have been lobbying for the pre-order privilege for years so that they could better compete with traditionally published book launches. One of Amazon’s main concerns—the reason this feature has been a long-time coming—was that anytime an author fails to present a suitable manuscript up by the release date, this will create numerous poor customer experiences. Amazon is very big on creating positive customer experiences. Evidently, someone has the bright idea of the ten-day window and strict one-year penalty, which seems to have satisfied Amazon enough to give it a shot. I wouldn’t take that risk. I’m of the mind to publish the final version when initiating the preorder. A great blog as usual Chris. I’ve posted it my Facebook page and reblogged it. Please note that you can mark your content as final before this 10 day deadline and once you’ve marked your book file as final, you’ll still have until 3 days before the release date to make changes. You won’t be able to update your book in the 3 days prior to release. This is to ensure that your book is delivered correctly on the release date to the customers who have pre-ordered. Yes, releasing your book on May 11, 2015, you can update the version until the end of the day on May 07, 2015 11:59 PM EST, if you have uploaded the final version (selected “This is the final version of my book for release”) before April 30, 2015. And this updated content will be delivered to customers you have pre-ordered. So, yes even when it’s marked as final for preorder, you will have an opportunity (though small) to make changes to the final submission. This saved me from a world of hurt with my first book and will come in handy with my second upcoming release.